C/ Cala Molins s/n, 07469 Cala San Vicente, Spanje. In the privileged area of Cala San Vicente, in the north of Mallorca, rise itselfs Grupotel Molins, of romantic style with a touch of English. 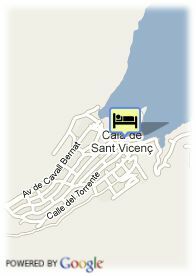 Half century in the business garantee this hotel as one of the most charming in Mallorca. All rooms of Grupotel Molins have a view over the Mediterranean sea, and they boast an exclusive service and a warm environment. The hotel has a meeting and conferences rooms with natural light for un to 40 people, recommended for small groups who seek tranquillity, far away from the noise of Mallorca´s touristic areas.